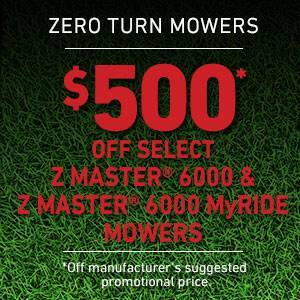 Toro Toro - $500 USD Off Select Z Master 6000 Series and Z Master 6000 Series MyRIDE Mowers Promotion Details | Available at Complete Outdoor Equipment Co.
*$500 USD off suggested promo price on select Z Master 6000 Series and Z Master 6000 Series MyRIDE Mowers. Models 74923, 74960, 74961, 74926, 74928, 74946, 74947, 74969, 78924, 78926, 78928, 74997, 74998, 75967 and 75968. Valid on purchases made from March 29, 2019 through May 29, 2019. See participating retailers for details. To find a local retailer.